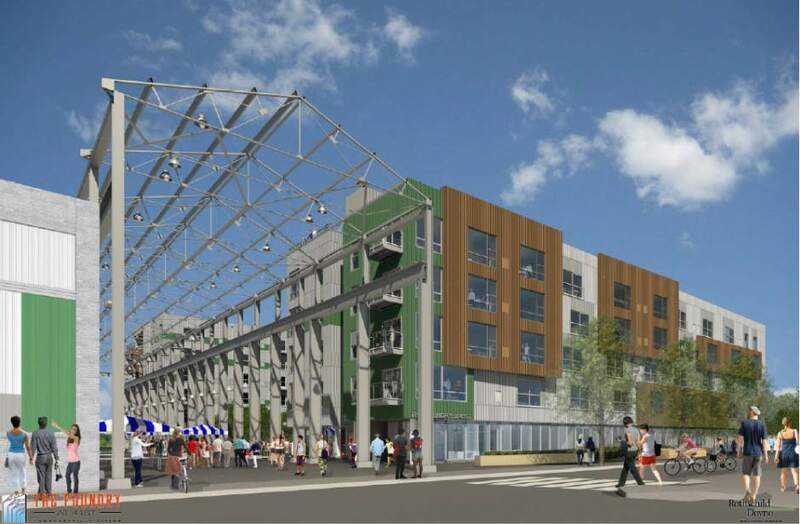 A $35 million housing development in Lawrenceville will have a football field-length public plaza under the steel frame of a former industrial building. “This unique public space will not only draw more people towards the (Allegheny) River, but give residents the feel as if they’re walking back in time into Pittsburgh’s World War II-era industrial heyday,” said Alex Simakas, who is partnering with Shadyside’s Walnut Capital Partners on the project. The site had been home to Simakas’ former Interlocking Deck Systems. For more than a century before that, Phoenix Roll Works made equipment for rolling mills. The planned five-story apartment building will be at Willow and 41st streets, near the 40th Street Bridge. Dubbed The Foundry at 41st, it will include 182 market-rate apartments, with amenities such as a large outdoor pool and a rooftop sun beach with Downtown views. The apartments are scheduled to open in spring 2017. They will include “micro” apartments and one- and two-bedroom units, with monthly rents starting at $1,100. A former machine shop on the site will be marketed for shared office space or retail or restaurant use. The development’s most distinctive feature will be the steel frame for the 300-foot-long, 50-foot-tall building that was known as Bay 4. It aligns with 41st Street and will provide a corridor from Lawrenceville’s busy Butler Street to railroad tracks that run behind Simakas’ property near the Allegheny River. Plans are not clearly defined for the public plaza, but the nonprofit Lawrenceville Corp. is expected to head up a public planning process. “The vision is to activate that space and create some connections” between Butler Street and the riverfront area, said Matthew Galluzzo, Lawrenceville Corp.’s executive director. Galluzzo mentioned an open-air public market and food truck roundups as possible uses, which could be set up quickly and removed just as fast. A ceremonial groundbreaking is scheduled for Wednesday.